Choose from a selection of beautiful, customizable website templates specifically designed for representing music companies & artists. A customizable catalog search page with automated metadata tagging for quickly filtering through genres, moods, key, instruments, tempo, & keywords. A full suite of pitching tools including track & playlist sharing, sync-to-picture editing, contacts & email analytics (clicks, plays & downloads). A super secure cloud infrastructure with website, catalog & data hosting across multiple servers. A complete website management system for easy editing & self-publishing of all your content; artist info, news posts, events, featured tracks, placements & social media. A fully-fledged asset management system for managing all catalog audio & track metadata. 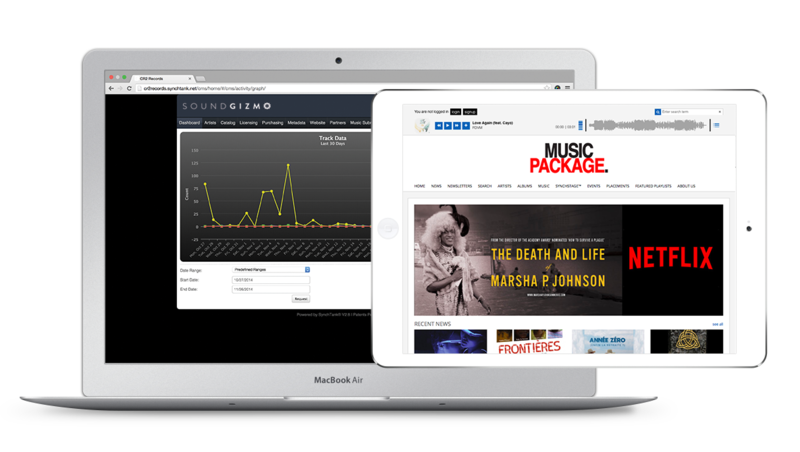 Developed by the team at Synchtank, Soundgizmo is a website and catalog management system built for small, fast moving companies who don't need big enterprise features or integration. Generate more revenue from your catalog with a core set of tools to help you organize, pitch and license your music.